Innovative, future-forward menus have the capacity to capture guests’ attention, retain existing business and recruit new diners. But adding specialized, well-coordinated and themed dining events to the mix can be a dining room game-changer. Not wanting to lose precious momentum generated by a host of specialized dining campaigns, such as Heart Health Month (February) or National Autism Awareness Month (April), Boston Children’s Hospital doesn’t rest on its special-event laurels. Rather, the facility activates internal, proprietary and ongoing efforts that are “destination stops” for its patients and their families at the 398-bed facility in metro Boston. Armed with a support staff of 100 employees who serve 1.5 million meals a year—patient plus retail—Boston Children’s Hospital holds a host of annual and holiday dining themes. But it’s three ongoing events that burnish its reputation as a top-class dining provider: Chef’s Playground, Culinary Academy and Parents Night Out. All are held on a monthly basis for a few hours on the first, second and third Wednesdays of the month, respectively. The trio of events features unique, focused templates where the sum of the parts is greater than the whole. Chef’s Playground is what Goldrick calls “an open-exhibition kitchen concept built on transparency,” as patients and visitors watch meals being made to order by renowned chefs. Dishes include rotisserie-style proteins, noodle bowls, and locally sourced meats and produce. Knowing the rigors that parents of terminally ill children undergo, Parents Night Out is scheduled with the assistance of Child Life Services, which helps patients and families adjust to a hospital experience. At Columbia University in New York City, food serves as a central, unifying experience as well. A litany of special events—more than 40 a year—are all crafted with vision and timing at their root. First-year students must participate in the Columbia meal plan. Those 5,600 students dine at one of three central facilities. 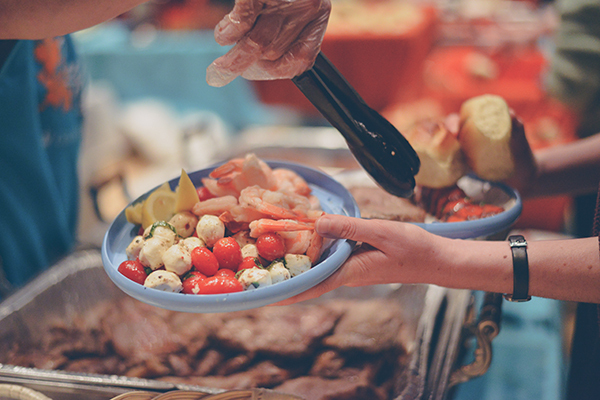 With an innovative menu and themed events to generate extra excitement, 80% of first-year students opt to remain on the program during their second year, says Columbia Director of Dining Justine Sacks. When Thanksgiving rolls around, Columbia has found smashing success with its Thanksgiving Feast, which draws 700 students during a single day in November. Students reserve space well in advance because the event, held in two separate sessions, sells out quickly. Similar to Boston Children’s, Columbia’s dining events offer a proprietary flavor. 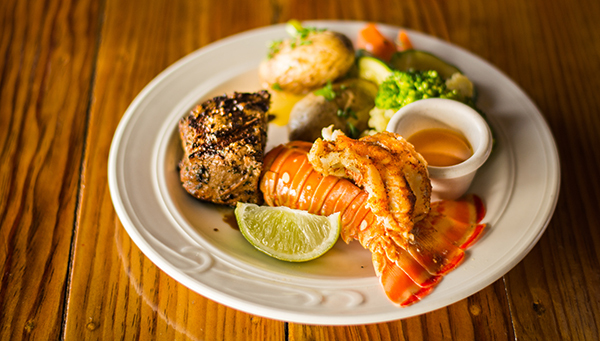 Held in April, its Surf and Turf Dinner is prepared by Executive Chef Michael DeMartino. Offering steak and lobster tail, shrimp, an ice cream station, mountains of strawberries, corn on the cob, stuffed poblano peppers and more, the outdoor event has a beach-oriented theme, and students receive Frisbees and Hawaiian leis. In inclement weather, the event moves inside. With Columbia events, timing is everything. “We schedule several special events around midterm and final exam week to allow students to escape from the hustle and bustle of studying—it’s a time when they’re in the doldrums and need a break,” Sacks says. Another winning theme that helps galvanize the student body at Columbia and bring equity to the dining program is the weeklong Battle of the Dining Halls Food Fight. Held in early December in a campus auditorium, the event pits the fare offered at the three core dining facilities against one another for a festive, if not intense, competition. But these events don’t just schedule themselves, which makes planning across several departments key to what foodservice directors call a collaborative approach. A finished dining theme actually starts “as a blank canvas where we plan something based on feedback received from other groups, like our celiac or cardiology departments,” says Goldrick of Boston Children’s Hospital. The celiac department, for example, might suggest menu items emphasizing a gluten-free diet. An infusion of heart-healthy foods, such as whole grains, might come from feedback from cardiology. Goldrick and his team proceed to shape a menu accordingly, which is then integrated into a special event. “We might decide to have an event that places an emphasis on foods made with kale, touting the benefits of eating it and perhaps demystifying it,” he says. Columbia Dining receives invaluable input about menu planning from its Dining Advisory Committee, which is made up of students, Sacks says: “Students are on the front lines of dining and food-related trends. We see them as stakeholders in this effort, and they serve as a sounding board” for establishing cutting-edge menu ideas that can also fit into the fabric of various themed events. Dining personnel invite 20 to 25 students from the advisory committee to its meetings, where they offer their ideas. “Our students are very savvy when it comes to food and are an important piece [of that] effort,” Sacks says. Results are often dictated by an organization’s priorities. At Columbia, dining personnel are eager to retain first-year students on their rolls. In addition to the 80% of first-year students who remain, upperclassmen find value, too: 65% of third-year students remain on board, while 40% of fourth-year students do so. At Boston Children’s Hospital, success is measured in smiles. “While we know that events trigger an increase in meals served and generate new diners, we know we’ve succeeded when parents tell us that a Parents Night Out lifted their spirits and helped open lines of communication with nurses and doctors,” Goldrick says. “Or when a young patient attending the Culinary Academy made cupcakes to bring back to their nurses.” It’s a different brand of ROI. When celebrity chefs such as Steve DiFillippo, owner of Davio’s restaurant in Boston, lend support to Chef’s Playground, it is not only “about the great food, but their presence allows patients to interact with a celebrity chef they’ve seen on the Food Network. It’s a very positive experience for them—it’s more than just the food,” Goldrick says. Terms such as “healing” and “therapy” are core benchmarks for the success of the Boston Children’s dining program.